A team of scientists at the Massachusetts Institute of Technology (MIT) have suggested an intriguing technique for producing an especially resistant armor for soldiers of the future. The military-funded research, which draws its inspiration from a study of a primitive form of fish called Polypterus senegalus, could direct the scientists towards novel, even revolutionary, ways of designing protective armor for humans. 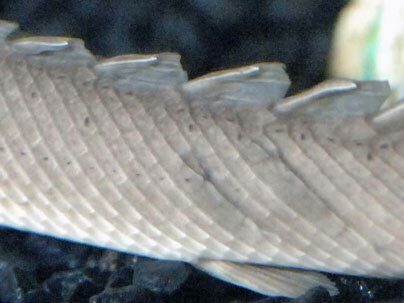 Nicknamed “dinosaur eel”, the Polypterus senegalus is a long-bodied, lizard-like fish whose origins can be traced back as far as 96 million years. The specie, which can still be found in the muddy freshwater shallows in Africa features a full-body armored “suit” – an extremely rare characteristic today, but one that was quite common among ancient fish which inhabited our planet millions of years ago. “The primary predators of Polypterus senegalus are known to be its own species or its carnivorous vertebrate relatives, and biting takes place during territorial fighting and feeding,” – explain the scientists. This “suit” consists of small individual armored scales, comprised of multiple material layers, each of which is about 100 micrometer thick. While the fish’s armor structure has already been studied by biologists, the scientists at MIT’s Institute for Soldier Nanotechnologies were the first to map out the exact nature of its layers, revealing a structure in which the layers complement one another in a way that effectively protects the soft tissues inside the fish body. One big advantage of such layering is its strong resistance to a penetrating biting attack. By applying various nanotechnological methods to study the material properties of the “armor,” the scientists concentrated on exploring a single fish scale, revealing four different layer materials. Each material differs from the others in its internal structure and geometry, while the sequence of layers is efficiently joined to protect the fish from any external bites or blows. MIT scientists say their research will contribute to their understanding of the relationship between a specific threat and its appropriate corresponding armor design – “Such fundamental knowledge holds great potential for the development of improved biologically inspired structural materials, for example soldier, first-responder and military vehicle armor applications,” said Christine Ortiz, an associate professor at MIT’s Department of Materials Science and Engineering and lead author of the recently published paper in the journal “Nature Materials” on the subject. “Many of the design principles we describe–durable interfaces and energy-dissipating mechanisms, for instance–may be translatable to human armor systems” – she said. In one experiment, the scientists have imitated a biting attack on top of an individual scale, which revealed that such remarkably light design forces cracks to run in a circle around the penetration site rather than spreading through the entire scale and leading to catastrophic failure, as it happens in many ceramic materials. The scientists have also concluded that the overlapping junctions between the layers are responsible for deflating the pressure of a crunching bite. TFOT has previously written about a number of nature-inspired inventions – such is the grasshopper-inspired jumping robot, which is capable of jumping to a height of more than 27 times its body size! You can also check out our coverage about MIT’s “HolyBot” robot capable of moving on fluidic surfaces, whose design was inspired by the movement of “water striders” – insects that can run across the surface of water. More information can be found on MIT’s website.